Marie Dupuy and Mathilde Pedronno were both on the podium on Fridaynight. Marie got a bronze medal in the pointsrace and Mathilde got bronze in the one lap. Marie still goes to school, how is it to combine that with training? “It’s really hard, but I prefer to think about studies instead of skating.” Since there’s not much money to be made in skating she finds it more important to study. We might see her again in the marathon on Sunday, but that’s not her favorite race at all. How was the way to the final? “It was exciting and difficult. The semi-final was more difficult.” A lot of people find the semi-final harder than the final, because once you’re in the final there’s three chances for a medal. And in the semi-final you have to be first or second to go on. Note on Saturday: Mathilde made it to the 1/4 final in the 100 meter and will race against Anais Pedroni at 19:00. 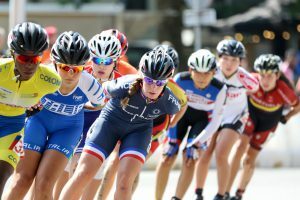 Worlds will be held from 1-3 july on the track in Heerde and from 5-8 july in Arnhem on the road. Go to wkinlineskaten.nl (website also in English) for tickets and info.